1. How about the securities are onboard? 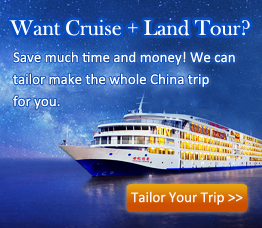 Inland River cruises feature narrow rivers, fast flowing water and submerged rocks, unlike sea or ocean cruises, especially the upper reaches of the Yangtze. During the low water period, some waterways become endangered for ships with a large draft. So, you cannot swim in Yangtze River while onboard. All 4 star and 5 star cruise ships are all equipped with the most secure facilities and all verified by the National Ministry of Communications of PRC and obtained the right to receive foreign travelers. 2. Where should I put my luggage? 3. Should I bring with my valuables? Yes, group travelers will have their luggage be arranged to be delivered aboard, and then placed into their rooms. For individual tourists, porters are paid one dollar per piece of luggage carried while embarking or disembarking.